I'm going over the gorgeous collection of stones my lapidaries sent me for Worldcon. Made me feel very dragonish, includes some remarkable Turkish stick agate (looks like stunning abstract expressionist paintings) among many others. The jewelry is finished, finally, and packed. Tonight I'll have most of the stones in proper papers and labels. Will do the precious stones tomorrow when I have more brains. Packing stones can go a little slow as I admire. Photo, as requested, and only fair of the dreamsnake is below. Delicately textured work just doesn't photograph well without more time then I'm willing to spend. 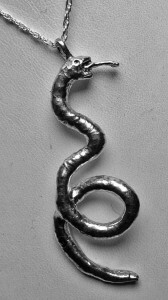 Bright sterling silver and height is 2". 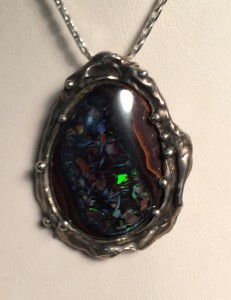 And from the collection of Nancy Cobb, an exceptional opal in sterling. The stone has many colors but the photo gives a sense of their vividness. I'm going back to pack the last of the largest stones in papers I made right before I started writing.